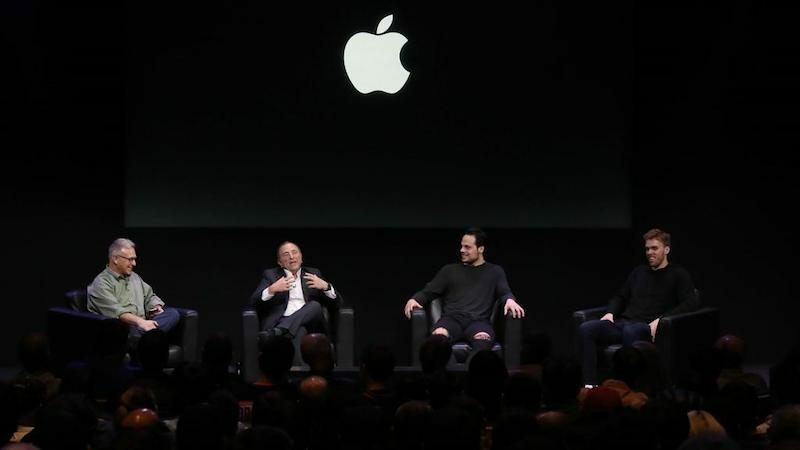 National Hockey League commissioner Gary Bettman, and star players Connor McDavid of the Edmonton Oilers and Auston Matthews of the Toronto Maple Leafs, sat down with Apple's marketing chief Phil Schiller on Thursday to discuss how technology is improving the game of hockey for players, coaches, and fans. The discussion took place at the Town Hall auditorium at Apple's Infinite Loop campus in Cupertino, California, less than 10 miles from the SAP Center arena in San Jose, where the 2019 NHL All-Star Game was played this weekend. One way the NHL has incorporated technology is by making iPad Pros available behind the bench, providing real-time video footage that helps players make shift-by-shift adjustments during games, and gives coaches a better idea of when to challenge a referee's offside or goaltender interference call. "We love the collaboration that we have with Apple," said Bettman. "It has helped transform the game without changing the game itself." "The game has never been as fast as it is," said McDavid. "You get out there, and these guys are flying around. We have two refs that are looking to call penalties, we have two linesmen, and it's not enough. You can't bring more refs. So what are you going to do? You've got to turn to technology." "I usually use it to prove to Hitch that it wasn't my fault," quipped McDavid, referring to Oilers coach Ken Hitchcock. The comment drew laughs from the audience of about 300 or so Apple employees, according to NHL.com. Matthews said he and the Leafs coaching staff use the iPads to study the face-off tendencies of opposing players. 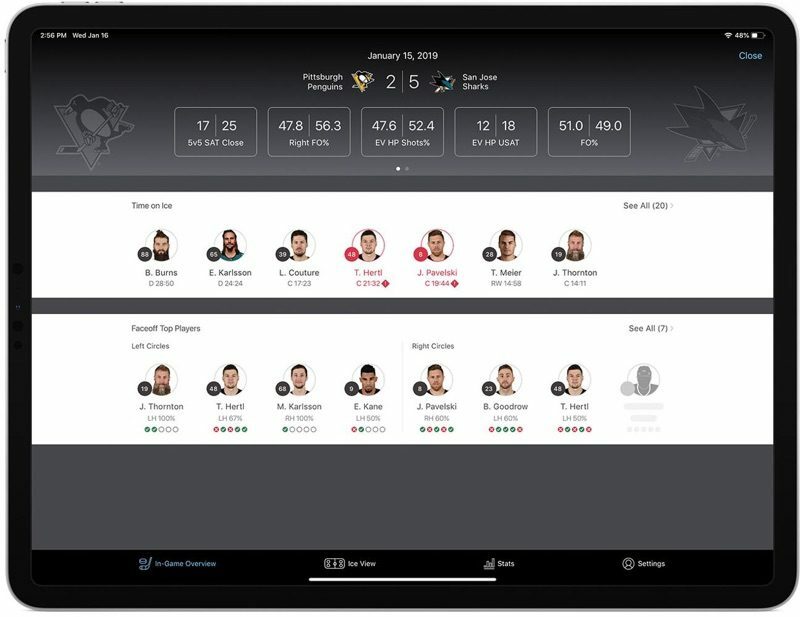 Earlier this month, the NHL announced that teams will soon have access to a new Coaching Insights App for iPad developed by the NHL, Apple, and SAP. The app will provide 35 player stats and 30 team stats in real time, such as time on ice, face-off percentages, shot attempts, and chances for and against. "Our collaboration with Apple and things like the Coaching Insight, which we do with SAP and their cloud platforms, are all designed to make it better for the players, make it better for the coaches and most importantly make it better for the fans," said Bettman. "So we're grateful for all we do together." The app is expected to be available at some point after the All-Star Game break. 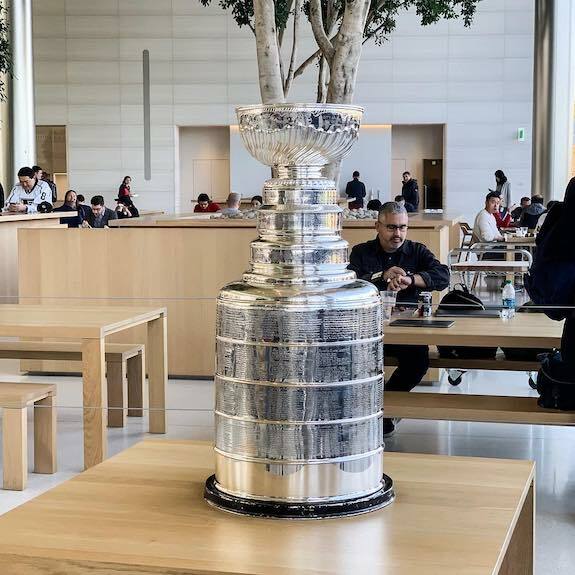 In related news, the NHL brought the Stanley Cup to Apple Park on Wednesday, providing Apple employees with an opportunity to take a photo with the iconic trophy at the company's new headquarters. Hat tip to Gary Ng at the blog iPhone in Canada. Won't the hockey authorities be annoyed someone planted a tree in their cup? Now that Apple are the hosts of the Stanley Cup a few changes will be made. - only one goal. Having goals at both ends is excessive. - the puck will now be thinner and weigh less. - all players, no matter what team will be required to wear the same uniform. Preferably a solid colour. - if a spectator wishes to cancel their ticket but did not purchase Applecare during the purchase of said ticket, there will be a $300 cancellation fee. you would be quite shocked to hear the stories about where that cup has been, and what has been put inside it. I do believe you are correct that is is a 12.9 i pad pro i can tell by the bend. OMG! Get back to work Apple! Mind your own business, get back to the spaceship and make Itunes work again!!! While you're at it, put some frigging ports on the Mac Mini!!!!! There's always that one person that finds the negative in everything. That would be minor compared to keg stands, use as a dog bowl as well as other more basic needs. And Hendrik Lunquvist catches 11 iPhones in a row. What is the guy behind the cup wearing on his right wrist? Looks a little like wrist mounted display of some sort?